In the last weeks, we've read published several back stories to our authors' novels, and these have proved to be very popular. However, this isn't the first time we've done this and looking into our archives, we found some earlier posts that we feel are worth re-posting. Gaining an insight into the strands that have brought a book together can reveal a lot about it and give you a new perspective on it. This one by Michelle Heatley about her lovely book, Fish Soup, would inspire anyone to read it. Read on to find out about what inspired her to write it! 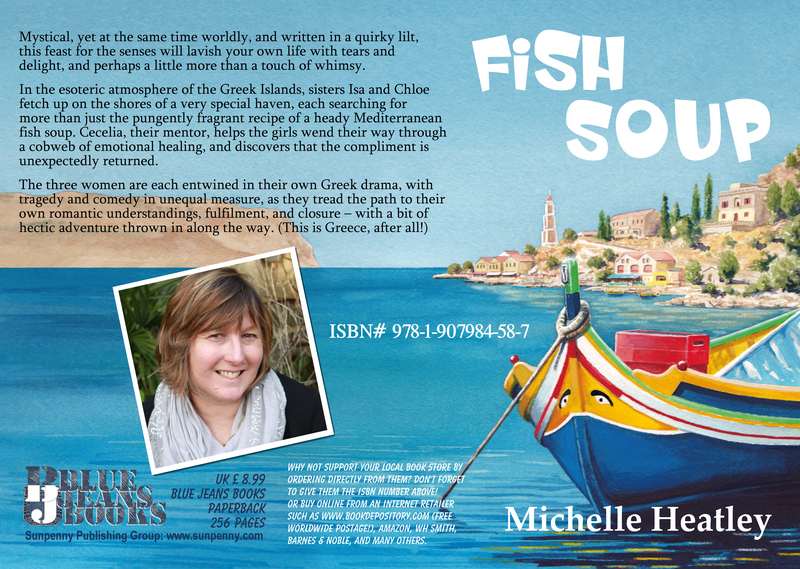 In the magical and esoteric atmosphere of the Greek Islands, sisters Isa and Chloe fetch up on the shores of a very special haven, each searching for more than just the pungently fragrant recipe of a heady Mediterranean fish soup. They come for the weekend, bringing their baggage with them: both kinds. Cecelia, their mentor, helps the girls wend their way through not only learning to make the soup, but also through a cobweb of emotional healing. Unexpectedly she discovers that the compliment is returned. Inspiration can take hold of an author when least expected. It could be as simple as the scent of the air as a breath of wind blows across the sea carried by an easterly wind, the vibrating high-pitched call of cicadas on a hot Mediterranean evening, the sight of the evening sun glowing on pastel coloured houses or as delicious as taste of fish soup on your tongue. Sight sound, smell and taste, all awaken the soul of a writer it makes and makes me want to capture them on the page. ‘Fish Soup’ began with taste. A spoon dipped into a bowl of rich Portuguese Fish Cataplana, a fish stew filled with the flavours of the land and sea. I tried so many times to recreate this delicious fish stew at home without success, until I eventually realised that some tastes can only to be savoured in the country that named it. After the intense taste, came the sounds of cicadas battering my ears on sultry Mediterranean days and the sight of white painted fishermen’s cottages, glowing pink, bathed in the evening sun. But, it is the sea that inspires me more than anything else and it awakens all of my senses. I live in South Devon where the sea is a constant presence. I am lucky enough to be able to walk to the shore, where I can breathe in the heady mix of scents swept in on a warm summer wind, taste the salt on my lips after a winter storm, see the colour of the water change from pewter grey, deep cobalt blue to tropical azure and hear the waves chuckle and chatter on the pebbly beach. With each different sensation my fingers itch to capture it all on the page. There are so many senses that have inspired my novel ‘Fish Soup’ but the sense that is most important when dipping into a bowl of delicious fish soup is taste, always taste. We loved this post and are delighted to be able to bring it to you again in this updated form. Fish Soup is a lyrical and lovely novel that is worth reading twice as well! Oh, For the Love of Reviews!